For us, the appeal of the 20th St. Emporium commission was the idea of a shop with an apartment above, combining the bustle of public space with the private, domestic life upstairs. Miniatures are never simply about the objects or the architecture, they are about the lives of the inhabitants of small spaces. 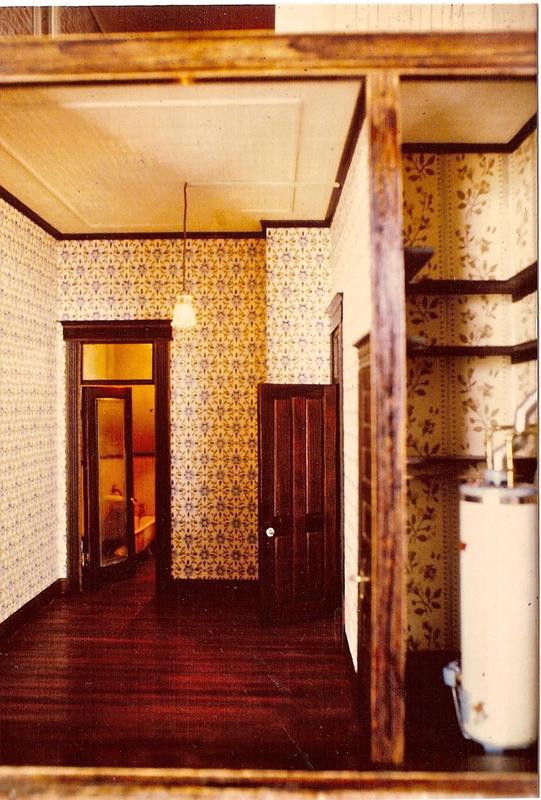 We learned early on that the adult’s attraction for dollhouses is the same as the child’s—we want to get our faces in each room, close enough to imagine ourselves inside. It also involves the attraction of voyeurism, what we see through the window when we walk down a street at night, glancing into homes with people sitting around the dinner table, or reading the paper. We are drawn into their lives, the hominess of the scene. A world of illusion, without strife, or bills to pay. This is why we designed our houses and buildings to look complete on the front, but then to have every interior space as accessible as possible, either through open walls, or window sections that swung open for a larger view. Yes, little rooms like bathrooms, closets and halls were often available only in glimpses, or with dental mirrors, but that has its appeal too. Every view offers an invitation to dream. 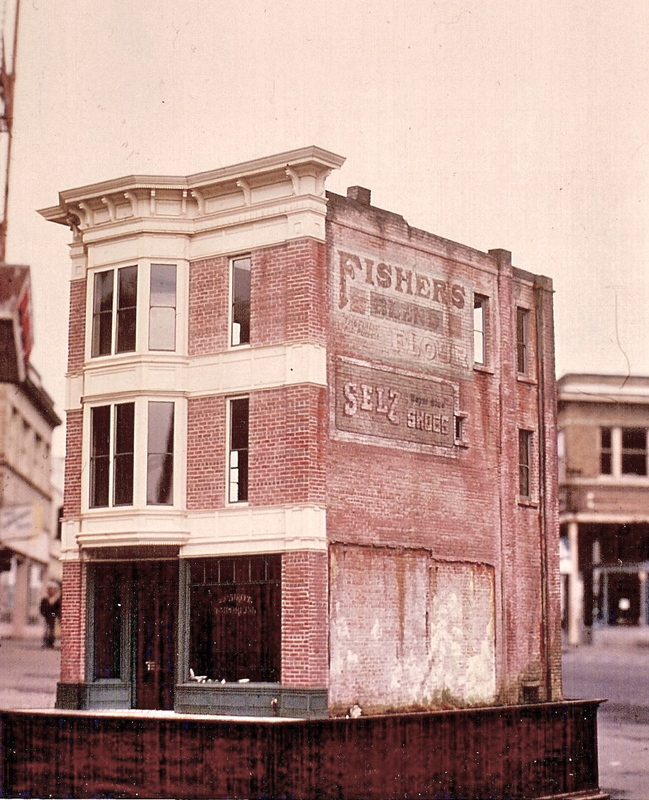 I found this B&W photo of the Emporium basement, taken by the original owners, Mr. Peepers Miniatures in Seattle. 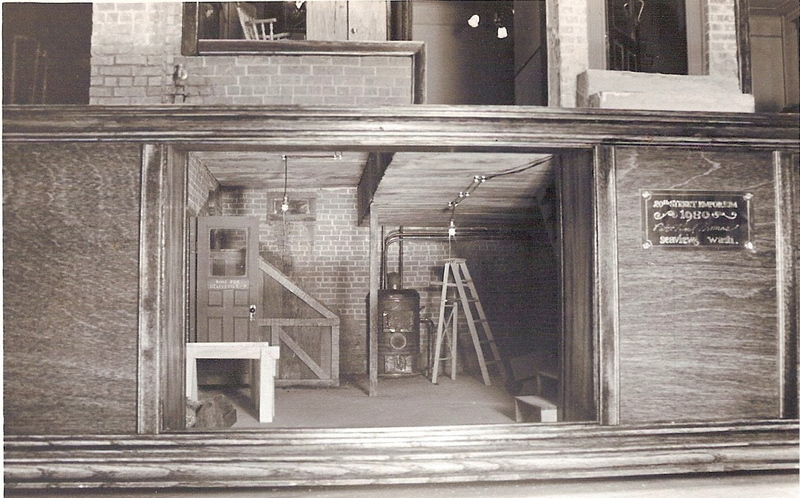 Besides all the detail we built into it—furnace, coal bin, tiny window, lighting strung across the ceiling, brick walls, cement floor—it is two other details, provided by the owners, that bring this room to life—the set-up ladder, and the open door. It is no longer a replica room, but a scene from life. Someone has just left the room, we imagine, maybe to find a bulb to replace the one over the ladder. We have been transformed from watchers to participators. We believe. It is that element that kept Noel and me going all those years. The building was just the foundation, so to speak, for creating that feeling of someone just having left the room. Noel and I have both been apartment dwellers, so the Emporium kitchen reflects everything we wished for in our apartments—an eat-in kitchen, and window over the sink, from which to watch the world while washing the dishes. We sacrificed counter space to make the room for the old fashioned Roper range and fridge then on the market. The cutting board is pulled out, and there’s that tell-tale open door again. How simple it is to capture us, once we want to be caught. In our own house, as well as in many old homes we visited, there was usually a closet or two that hadn’t been redone when a room was updated. Instead you saw old pink calcimine paint, or out-of-style wallpaper from an earlier era. Another trigger for the imagination. The side opening of the Emporium provided a perfect location for such a closet. Plus, Mr. Peepers had just found someone making detailed and in-scale water heaters—the perfect addition to the room off the kitchen. What’s barely discernible in these photos is the pressed tin ceiling, a staple of apartments and commercial buildings of the era. The project involved expanses of ceiling space, so we needed a good solution. In another case of friends helping friends, combined with the Eureka process, we talked over our dilemma with Bob, a contractor friend and aficionado of Victorian detail. His face lit up as he reached into his shirt pocket, pulling out his newly printed business cards. 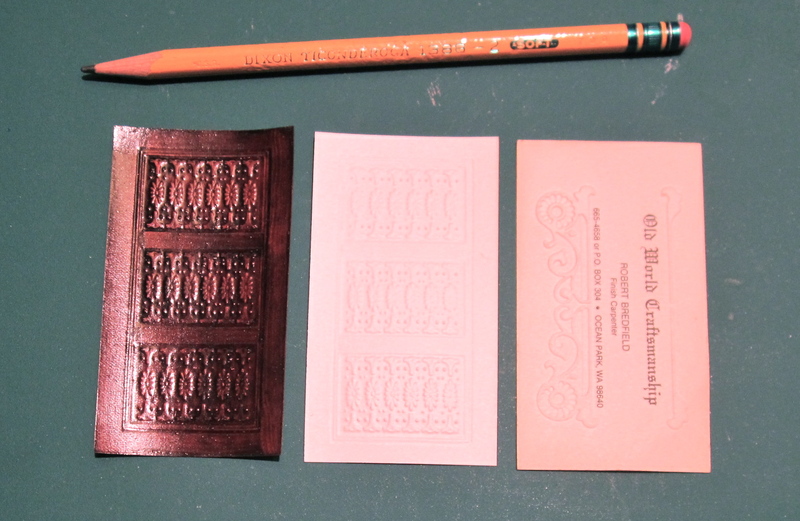 They were embossed with an ornate Victorian gingerbread design. He said all kinds of designs were available at the local printery. This immediately morphed into our finding an embossed design that could be ganged-up on a business-sized card to look like tin ceiling panels. Rick the printer loved the idea (he also printed our miniature newspaper insulation) and helped us find a suitable design. The bas relief was subtle, just enough to translate into the feeling of pressed tin, without drawing too much attention to itself. One sensed it was there, and knew what it represented without thinking about it. An added benefit was that when we glued the “panels” to the ceilings, the card stock warped slightly, just the way the full-size tin panels do. Once they were in place, we painted them off-white, with enough gloss to reflect off the raised portions. Of course the minimum order was a box of 500, far more than we needed, but the box was small, and the price not astronomical. We used only a fraction of them on the Emporium, and later used more to represent the embossed wainscotings Anaglypta and Lincrusta–popular turn of the century wallcoverings–in a formal library room, by staining the panels brown. My New England parents taught me never to throw anything away, giving us permission to hoard many of our supplies, and possible supplies (some day I’ll write about our rust collection). 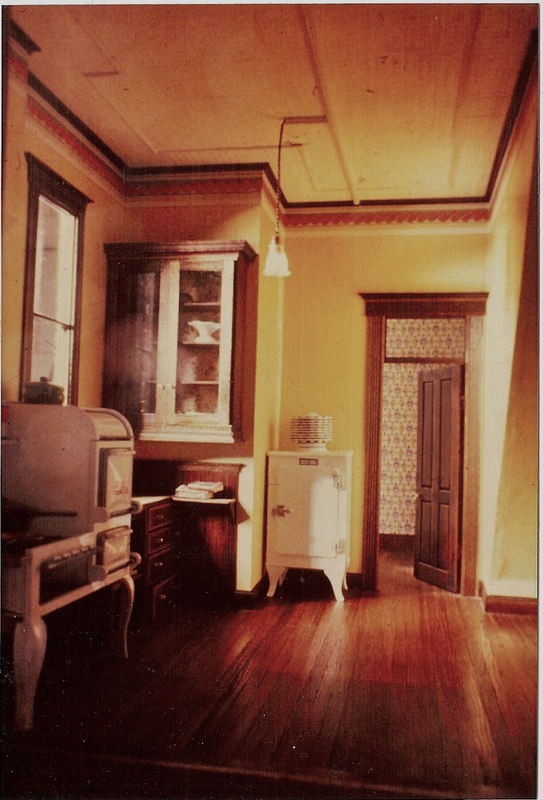 This entry was posted in Houses, Miniatures and tagged basements, dollhouses, lifestyle, Victorian architecture. Bookmark the permalink. Karin, they’re yours, except for a few to the first to reply. Send me an email at info@thomasopenhouse.com with your name and address, and we’ll discuss the details. I can’t tell you how much I’m enjoying reading your posts and hearing the back-story of all your wonderful houses. I admire your work so much and feel very privileged to be able to read some of your techniques. Thank you so much for taking the time to share!! Is there any way to purchase one like this now? I’ve been thinking about it for weeks, searching online, and still haven’t found anything quite like it! The Octagon was one-of-a-kind, as were all of our houses, and I don’t know of another octagon built in miniature. A couple of our tower houses are available for sale, but not this one as far as I know.